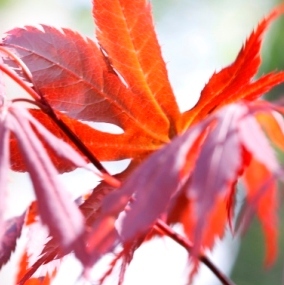 In just a week the new leaves of a small Acer in the Spring Garden have unfurled and turned a beautiful deep purple colour. Today was cloudy and windy with intermittent sunny spells. As the wind lifted the leaves the sun shone through turning them a warm orange. Fantastic! Here’s a few images to show how the leaves changed as the wind blew. Just click the first photo to view the gallery.